BARTELS WINS IN RIO: Hawaii's Melanie Bartels defeated the top two surfers in the world yesterday on her way to victory in the Billabong Girls Pro in Rio De Janeiro. Bartels eliminated world No. 1 Stephanie Gilmore of Australia 19.00 to 18.50 in the semifinals and then topped No. 2 Sophia Mulanovich of Peru, 14.34 to10.60 in the final. Bartels took home $12,000. JACKSONVILLE, Fla. » Veteran guard Chris Naeole, who tore his quadriceps tendon off the bone last November and was released four months later, has re-signed with the Jaguars in hopes of bolstering an injury-riddled offensive line that is without three starters. "I know some people probably thought, 'He's done. He ain't coming back,"' said Naeole, who played high school ball at Kahuku. "But that's just a little more ammunition to get back and get going." Former University of Hawaii women's athletic director Dr. Donnis Thompson has been named one of five Lifetime Achievement Award recipients for 2008 by the National Association of Collegiate Women Athletics Administrators. The Lifetime Achievement Award is presented annually to athletics administrators who have dedicated their professional careers to advancing women in sport. This year's luncheon is Oct. 12 at the NACWAA convention in Atlanta. The Chaminade men's soccer team dropped a 1-0 heartbreaker to Cal Baptist yesterday at Saint Louis School as the Lancers scored a golden goal at the end of the first overtime. The Lancers' Tim Wardell connected off a pass from Martin Medina in the 100th minute to drop the Silverswords to 1-5. Hawaii-Hilo middle blocker Fabiane Seben was selected yesterday as the conference volleyball player of the week for the second time this season. Seben, of Brazil, earned the Montana State-Billings Tournament Most Valuable Player award last weekend, and hit .303 with 69 kills and 13 service aces for the week. 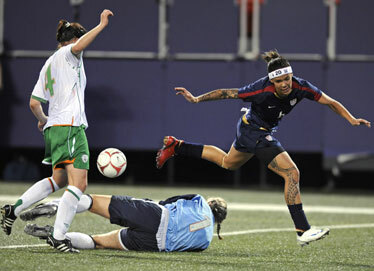 Natasha Kai was thwarted by Ireland goalkeeper Niamh Fahey on this play but the Kahuku and Hawaii alumnus beat Emma Byrne later in the match for the winning goal. EAST RUTHERFORD, N.J. » Natasha Kai scored in the 72nd minute and the U.S. women's soccer team beat Ireland 1-0 on last night at Giants Stadium in the second game of a 10-game post-Olympic tour. Briana Scurry preserved the victory with a late diving save on Michele O'Brien's shot. Ireland's Aine O'Gorman also had a chance at an empty net in extra time, but Heather Mitts cleared the ball away. After failing on multiple second-half opportunities, the Americans broke through when Carli Lloyd fed Kai with a pass from inside the penalty box. Kai's left-footed shot from 12 yards away went past goalkeeper Emma Byrne and inside the right post. Kai has scored in consecutive matches and has 15 goals in 21 games this year. Just 6 minutes earlier, Kai missed an open net when her shot from 15 yards away flew over the crossbar. "There was frustration here and there, but we finally got through it," Kai said. "We had one great opportunity and we finished it."